This metal seeker offers you an extraordinary tour of finding precious metal deposits with an easy-to-use interface, which is ideal for both pros and amateurs. It is designed with a rugged construction for different soil conditions. A complimentary 8.7'' waterproof search coil is perfectly submersible for shallow water detections. With this multifunctional metal detector, you are allowed to either seek for paydirt including gold & silver or dig out some screws & nails to make your backyard more friendly. In order to satisfy your different purposes of metal finding, this metal detector features 2 different switchable modes to offer you a better operation. It will respond to you promptly when it senses any metal under a motion all-metal mode, on the contrary, the disc mode only aims at what you desired, which can make your detection journey more specific and focused. 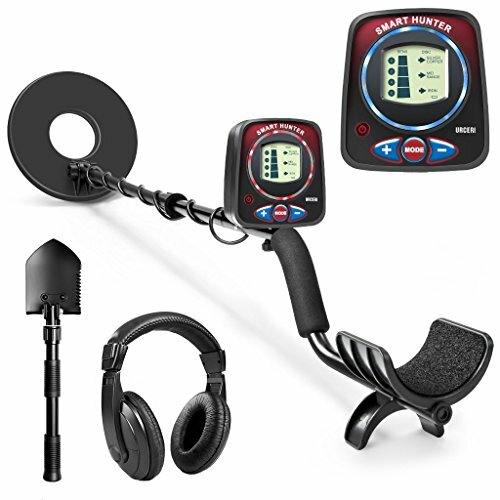 Unlike other metal seekers, this high-performance metal detector has an illuminated LED screen to display rich contents, such as sensitivity level, depth and battery level, allowing you to get real-time data during the whole detection. A battery indicator is also included, which will notify you when the battery is low. To further enhance your operating experience, it features a headphone port so you can connect to the free headphone included in our package or your own one for an excellent sound output. If you have any questions about this product by URCERI, contact us by completing and submitting the form below. If you are looking for a specif part number, please include it with your message.